Earlier today, T-Mobile announced that it has pushed the button to launch its Voice over LTE service in Seattle. This means that Seattle-ites will be able to make regular voice calls using an LTE connection, and not have their phones switch to an older network technology to do so. One slight caveat: Only specific phones will be able to make use of the service right away. T-Mobile stated that – after a software update – the Galaxy Note 3, LG G Flex and Galaxy Light would all be able to take advantage of VoLTE. One question we’ve been asked after the announcement – and has come up elsewhere online today – is whether or not the iPhone will support this new service. And the answer is: Probably not. But, the iPhone is technically capable. It just comes with a compromise. One of our regular followers, Joe, got in touch with us. Turns out the iPhone 5, 5s and 5c has some coding in it pointing towards VoLTE. 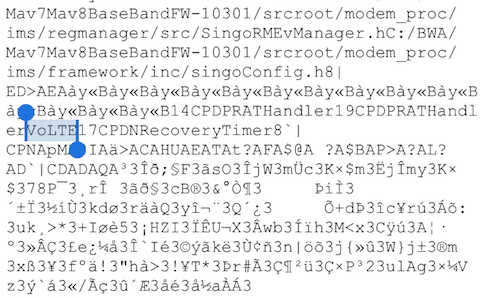 The code is within the baseband itself, or the firmware of the actual chip Apple uses for LTE connections. Specifically, the Qualcomm MDM9615m, which is used in all of Apple’s LTE devices, including iPads. 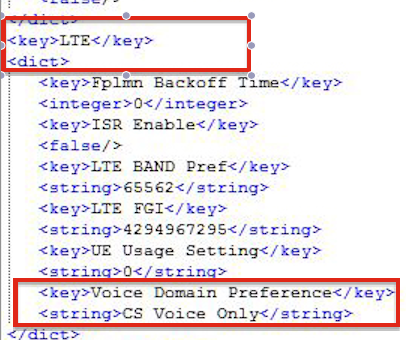 As you can see, VoLTE is specifically mentioned within the iPhone chipset’s own firmware. So, the chip itself is capable of making calls over LTE. The reason it doesn’t do so right now is because Apple/T-Mobile haven’t released a carrier update to make it happen. And the sad news: It probably won’t. A more in-depth look at T-Mobile’s carrier settings (above) reveals a string of code related to the way LTE can behave. This particular code string is found within the overrides PRI file. This file exists for every carrier, and tells the phone how to behave on the carrier in use. For current LTE devices there are two kinds of calling methods. The one most often used, is the one displayed here. It uses VoCSFB, referred to here as “CS” or “Circuit Switched”. Currently “CS Voice Only” would indicate that it’s forced to use the Circuit Switched domain. This tells your phone to use older network technologies for phone calls when you have an active LTE data connection. The rule ensures that if you receive a phone call while you’re using LTE to browse the web, or use data in any fashion, it’ll downgrade to 3G/HSPA+, to ensure that you can keep both connections running at once. Uncertainty – Simultaneous Voice and Data with VoLTE? Here’s where I get conflicting arguments chatting with our various network and bandwidth gurus. One believes a carrier update is all that’s required to get this service running on an iPhone. VoLTE and any other data connection should work just fine at the same time. In the same way that you can take a FaceTime audio call over LTE, or have background data or iMessage while browsing the web, you should be able to receive a VoLTE call browsing the web. Our second school of thought is that the LTE chip in the iPhone isn’t capable of running voice and data connections simultaneously. I say that, technically, VoLTE is a data connection, so in essence the iPhone can’t have a VoLTE call going and have you browsing/streaming at the same time. So if a carrier update was released to take advantage of the iPhone’s VoLTE compatibility, users would have to sacrifice simultaneous voice and data. You’d be browsing or streaming in glorious full-speed 4G, then receive a call, and the connection to your on-screen content would close to make way for the phone call. Which ever of the two scenarios is correct in regards to simultaneous VoLTE and browsing/data, it doesn’t change the fact that VoLTE calls are technically possible. There’s a case to argue that Apple could allow a carrier bundle to come equipped with a toggle switch within the Settings app to switch simultaneous voice and data on or off (if it’s necessary). All this would do is tell the phone to either use VoLTE for voice calls, or switch to the previously mentioned “CS Voice Only” command in the code and route any calls to the 3G network. And then of course there’s battery life to consider. VoLTE is a more power hungry connection that the current CS (switch to 3G). And we all know the iPhone’s battery isn’t up there with the greatest. Ahhh glad to see my argument was correct from tmonews Seattle VoLte post. Hey Cam, have you seen this? I’m losing patience with T-Mobile and may be forced to take my carrier unlocked phone to AT&T. The in-building coverage is poor and I keep feeling like the donkey lead by the carrot with the promises of better coverage and better services – I’m still waiting for it to happen except I hate paying 70.00 a month for unlimited LTE data when the coverage just isn’t there. I don’t even get 4G HSPA+ in my own home. My brother with AT&T gets 2 bars of LTE. i hated the unlocked experience with tmobile so i got a branded tmobile phone so i can have wifi calling. it makes a big difference in a situation like your. T-Mobile wont have good in door coverage until after 600mhz auction. unless your in their 700mhz area. You should drop the unlimited data if you never get to use it. Just a suggestion, but have you given the T-Mobile carrier update hack a try? It does help with reception issues. Your gonna be waiting longer buddy, get a tmo phone or go to ATT and stop crying. Its a shame T-Mobile doesn’t have low frequency spectrum, if they had an even decent amount of 850MHz spectrum they could refarm LTE or even HSPA into it like they are doing with 1900MHz. Heres to hoping with mergers they can eat up all the spectrum they can get. Why support phones people currently use when it will be enabled in a phone that hasn’t been announced yet question mark. “A new chip that supports VoLTE and LTE data simultaneously”: There’s so much wrong with this statement that I don’t even know where to start. I agree, this whole article is a catastrophe of technical ignorance. Here’s my input, if I may. Utilizing VoLTE in a single chip, in theory, would require using different SIMs for the GSM/WCDMA and LTE radios, but comes with the obvious penalties of increased size, cost and power consumption (as is with voice + data over LTE) and, in addition, the cumbersome management of two subscriptions. Doing the same with one SIM card has been proposed, but such arrangement is not currently acknowledged by 3GPP standards, as this would lead to the registration of one SIM card to 2 core networks (2G/3G CS core and 4G EPS) simultaneously. Using dual radios would be ideal as it would overcome some of the limitations of VoCSFB, such as dropping any active LTE data session, call setup time, etc. Meanwhile UMTS networks haven’t had any trouble what so ever handling voice and data at the same time. Two SIM cards? Dude your making this WAYYYYY to complex, VoLTE should be able to handle data and voice without insane measures like dual radios or dual SIM cards, I doubt the 3GGP would fall on its sword with this when a technology released in 2002 was already doing this (UMTS). I blame Verizon for being stupid and not just using GSM from the start or better yet follow in Japan’s steps and skip GSM entirely and use UMTS and be lightyears ahead of everyone else. CDMA2000 is a bad joke, we have 4G phones that don’t just drop to 3G for calls but drop to 2G for calls (1xRTT)! This is just an assumption, but I’d willing to bet that MetroPCS areas are already VoLTE capable. Neville Ray, CTO of T-Mobile, said during the merger that T-Mobile would continue to maintain Metro’s existing VoLTE services on it’s towers which are now also part of T-Mobile’s LTE network footprint. Since the LTE towers are shared between the 2 companies, VoLTE is active on them and VoLTE capable devices should be able to access them, no matter which carrier the device is coming from. This article is a bunch of mud stirring nonsense, without any strong opinion. Is iPhone capable of connecting to VoLTE and utilizing talk+surf at the same time? Well since the original poster never made that commitment, let me give you that answer. Qualcomm MDM9x15 baseband processor that’s inside iPhone 5S is fully VoLTE compliant, and talk and surf is an essential feature of that service since LTE Release 8. There aren’t any what’s and if’s. I have no idea what are you trying to argue here, exploring the “gray” area and not committing to yes or no answer. So there you have it, all that needed to be said out of that entire amateur hour nonsense. If VoLTE is just a TCP/IP stream over LTE why can’t you simultaneously use voice and text just like you can have two apps simultaneously access the Internet? This sounds like a click-bait article.. err.. by definition, VoLTE stream is data.. soooooo… yeah..
Joe.. you’ve made this into something it isn’t.. You seem to forget.. The Galaxy S4/S5 is not on the list either and those are fully capable.. and newer than the Note 3. The Simple reason is there are a LOT more iPhones and S4s and S5’s out there.. They didn’t want to overwhelm the network with a large volume and just started with the model of phones that had a lower volume of people to do testing.. Please stop with the ‘click-bait’.. lets start a fight for the sake of the fight..
You damn well know and expect the list to expand.. No one single phone has a larger customer base than those 3 models.. Those will likely be added last. I hate sensationalistic articles.. dumb reality show types. 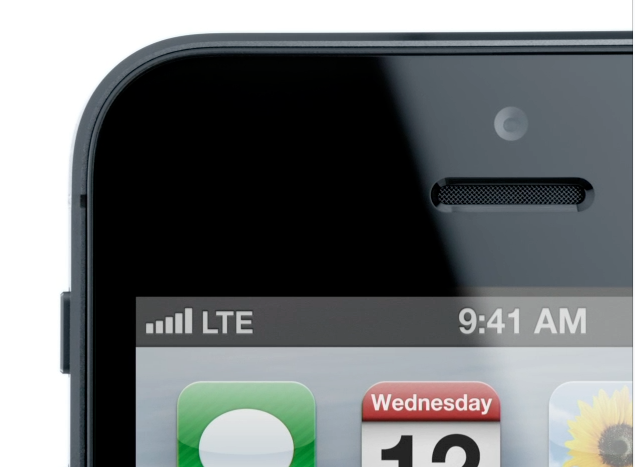 Topic: Whether iPhone can theoretically support VoLTE or not, and if so, where’s the proof? Proof has been provided, so it’s now up for debate (not arguing) whether VoLTE will cost voice + data abilities on the iPhone. We’re not talking about what all devices support it. That’s all in another article and off-topic for this article. The phones listed are simply a few examples of capable handsets. We don’t need to go down the entire list. Also, do you see my name as the author of the article? As much as I would like to satisfy you by fixing any problems you see, this isn’t my article nor is this my website. I have no control over what’s written and what isn’t. I simply contributed to some details specific to the iPhone and it’s VoLTE capabilities. Getting angry with me and cursing at me over something I can’t control is, not only unacceptable behavior, but also completely unfair of you to do. Also, the S4 came before the Note 3, but you are correct about the S5. No,proof has not been provided. Evidence that suggests it MAY support it has been provided. Or more specifically,we don’t know that it works. Think of it this way,how much effort would they go to ,to fix a problem with something that was not being,and might never be used. Would they spend hundreds of man hours on it and delay the product launch. Or would they just send it out and not worry. It could be half finished. It could be broken. Or it could work just fine. Or it could be code left over from qualcom reference code they didn’t bother to strip out. But its somewhat likely that its there,and probably does work. But to say its been proven is a serious overstatement. Its not proven until someone makes a VOLTE call. VOLTE IN MILWAUKEE WISCONSIN!!! WAY TO GO TMOBILE! Is that with the iPhone 5S?